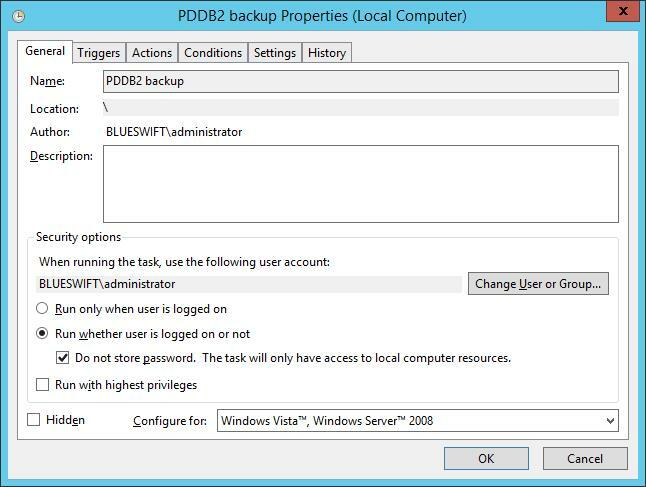 It is highly recommended that a regular backup of the PDDB2 database is made. 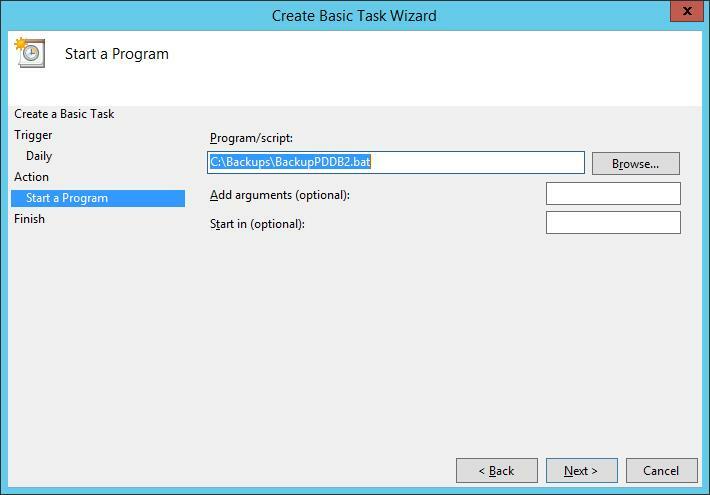 This document will describe the process of using a batch file to create a backup and then a Windows Scheduled Tasks to execute this batch file. 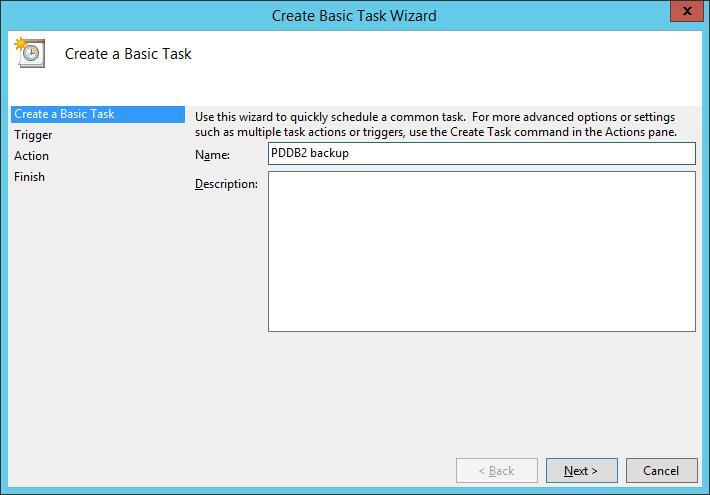 For the purposes of this example, we will be using the path C:\Backups\ to store our batch file and backup file. 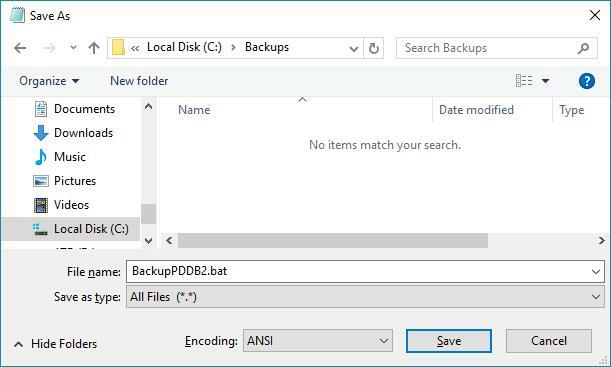 You may choose different folders in which to store the batch file and the resulting backup file. They don’t need to reside in the same folder. Open Notepad and save the file in the folder with the file extension .bat. I.e. when saving, change the Save as type: dropdown to All Files (*. *) and enter the full file name BackupPDDB2.bat. The correct path to the sqlcmd.exe application has been added to the PATH environment variable. This is normally automatically done when installing SQL Server. The text in bold type should be edited to match your parameters as required. The password for the sa user is unavailable, but the domain account under which the scheduled task will run is part of the sysadmin role. This means the script can be executed using integrated authentication as opposed to SQL authentication in the script above. The full path to sqlcmd.exe is included (for SQL 2014) since the PATH environment variable has the paths of previous versions of SQL Server which causes an error when running sqlcmd.exe. The SQL Server is using an instance name of PD. 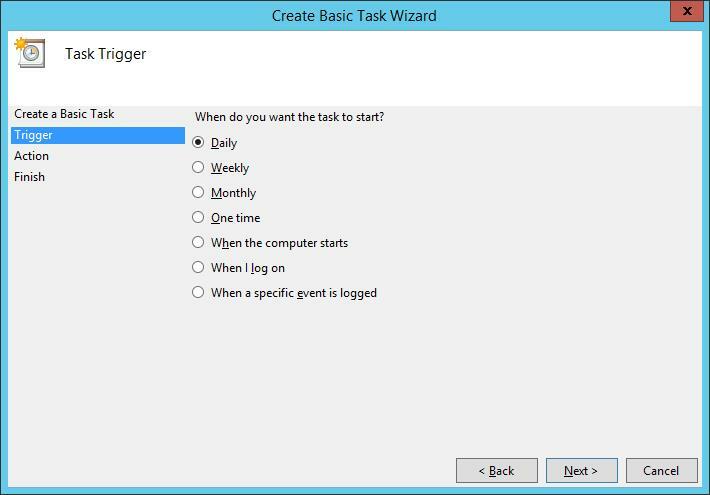 Right click the batch file and choose Run as administrator. 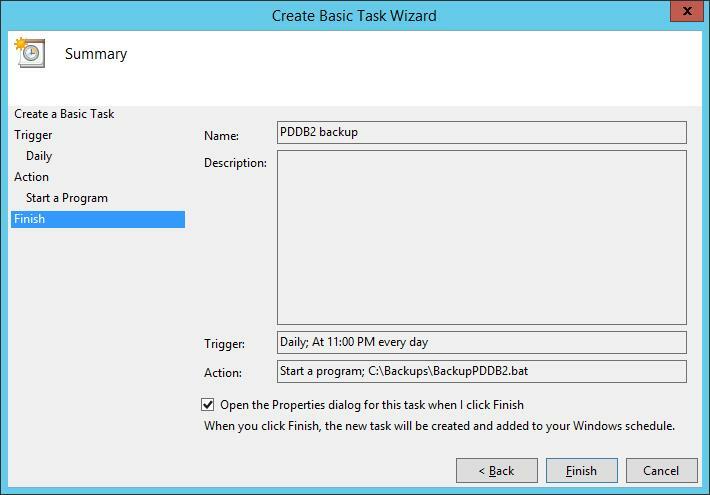 The backup file PDDB2.bak should appear. The process could take a number of minutes to complete. Once we know that the script works, ensure that the pause command is removed from the end of the script. 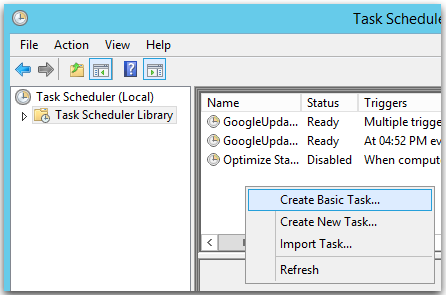 In the Server Manager, click Tools > Task Scheduler. In the Name textbox, enter PDDB2 backup. Leave the Trigger on Daily (unless you want a different schedule). Change the start time to a suitable time after hours. The example below is set to 11PM. The backup process may use significant resources if the database is large but the software will still be useable. There won’t be any downtime. 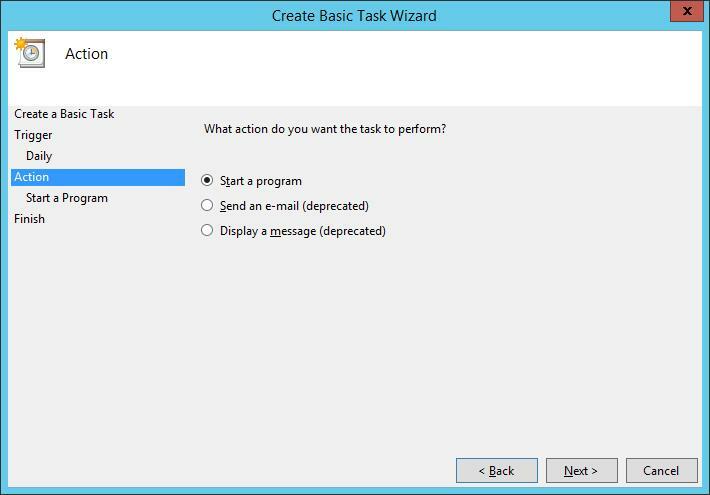 Leave the Action option on Start a program. Browse to where the batch file is saved. 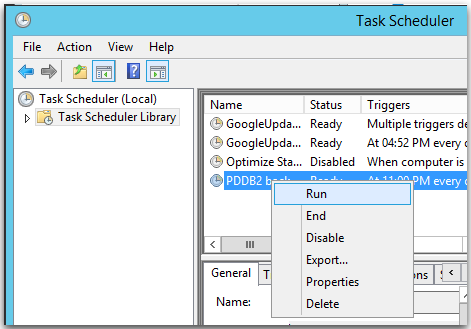 In the final Finish step, tick the Open the Properties dialog for this task when I click Finish checkbox. On the Properties form, in the Security options frame, change the option to Run whether user is logged on or not. Tick the Do not store password checkbox as no network access is required. First, delete any backup file in the folder that was created from a previous test. 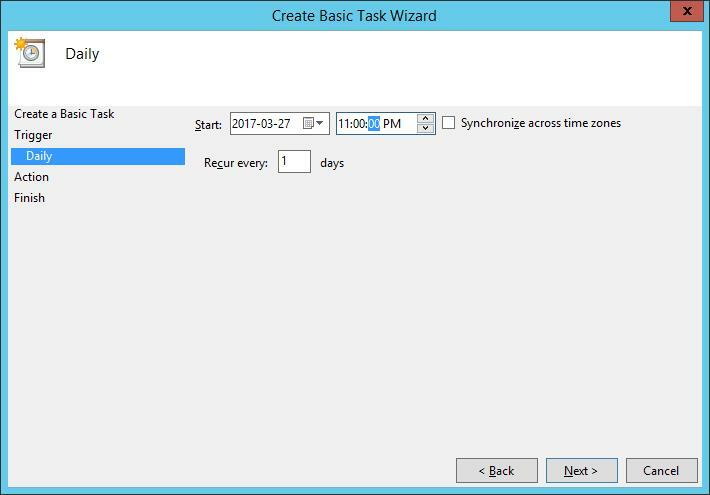 In the Task Scheduler, right click the newly created task and choose Run. Ensure that the task completes and the backup file appears as expected.